The Curly Wirly Twirly Girlies: Freebie to Celebrate Vicki's News ! 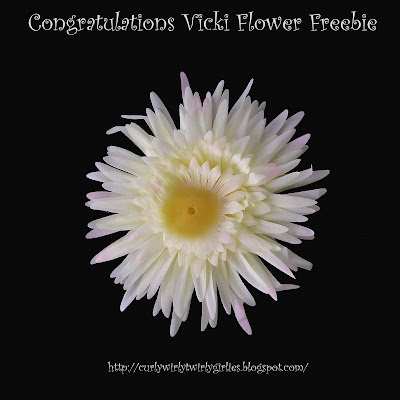 Freebie to Celebrate Vicki's News ! Wow - congratulations to Vicki for her wonderful news (http://vicki20.blogspot.com/). I am so thankful for Vicki for encouraging me to have a go at playing with PSE and seeing what I can do. So this is my e-version of a bunch of flowers LOL, okay so its just one. Posting some other stuff I have been playing with later. Have a great day and congratulations Vicki ! Isn't that great news?!!! Thank you for the lovely flower.